Tile flooring is now available in so many different materials and styles that ceramic tile - the traditional workhorse of tile flooring - sometimes gets overlooked. Year in and year out, ceramic tile doesn't lose its popularity with homeowners - and for good reason. Whether you're looking to place tile in your entryway, kitchen, bathroom or all-purpose room, ceramic tile is an excellent choice to make. There are many benefits to ceramic flooring and the two biggest are its reasonable price and long-lasting qualities. 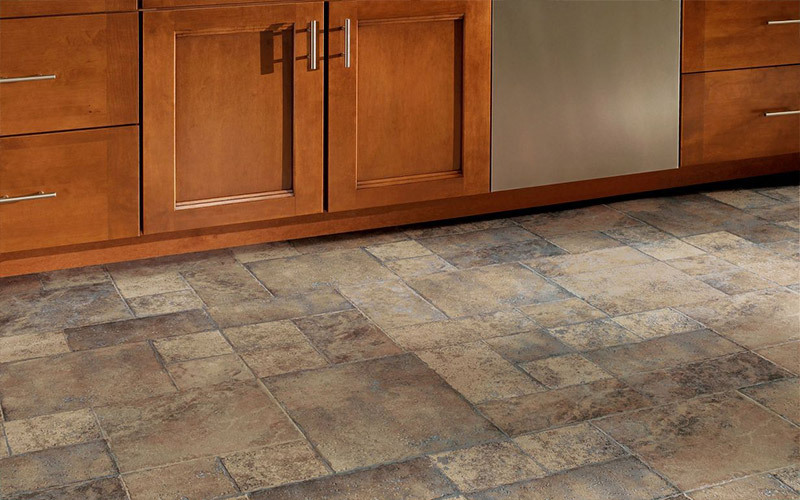 When installed properly, ceramic tile can last for decades. Ceramic tile is already one of the more affordable choices on the market and when you spread that cost over the years you'll enjoy the floor, it's a price that's nearly impossible to beat. Ceramic tile's simple maintenance needs add even more to its value. Ceramic tiles have a protective layer that makes them practically impervious to water and stain penetration. They are also naturally resistant to high humidity and moist environments. That's the main reason you see ceramic tile so often in bathrooms and kitchens. For the easiest maintenance, make sure your tiles and grout lines are sealed so water can't soak into the grout and cause mold, mildew or staining. Once your ceramic tile is installed and sealed, your maintenance requirements boil down to regular mopping. Dirt, stains, water... nothing soaks into ceramic so spills and stains just need to be wiped away. If your tile is in a high traffic area you'll also want to vacuum or sweep at least once a week to keep debris from scratching or damaging your tile over time. Ceramic tile is extremely hard so it's difficult to damage but it can be dulled or worn down over time. Ceramic tile is a naturally hard, solid surface. As such it doesn't hold onto dirt, dust, pollen or other common allergens. Wipe or mop your floor regularly and you can help keep the air free of allergy and asthma triggers. People sometimes think that ceramic tile is limited to standard 12x12 white or off-white squares. This is incorrect in two ways. First, current manufacturing techniques allow a variety of colors, patterns and designs to be printed on the top layer of ceramic opening up a wide range design options. Second, ceramic tile can be made or cut into just about any shape imaginable including triangles, rectangles and planks. Ceramic tile of different sizes, shapes and/or colors can also be installed to create a uniquely beautiful pattern in your ceramic floor. Learn more about ceramic tile flooring at Kermans Indianapolis Flooring store.